For the past few months I had been working attempting to solve a challenge per day on HackerRank. I like that site. A couple weeks ago I was introduced to LeetCode. Challenges seem to be more intense and requirements seem to be vaguer. Knowing this, one needs to think and plan the approach / algorithm with greater care and expect to fail unit tests that one would not think off. I just finished a challenge and decided to post in this blog my approach to solving it. I strongly recommend for any person involved in software development to take a look at the LeetCode web site (https://leetcode.com/), join and practice their challenges. It is an educational, humbling and rewarding experience. In my humble opinion, 1 / 2 and 2 / 3 qualify as data for the challenge, while 2 / 1 does not. The statement seems to describe the fraction in string format. No mention of positive or negative input is offered. The input values appear to be integers. Try a long division on 4/9, the repeating part is obvious. Now try 4/333. Do you see a pattern? Be wary of edge cases! List out as many test cases as you can think of and test your code thoroughly. A nice thing about LeetCode is that when you fail a test, you are provided with details about the failure and the line number in which the code fails. This is quite nice because no one develops code in the dark. HackerRank provides this type of information (I have never looked at it) but they demand a payment in Hackos. Hackos are points you have earned by solving previous challenges. The IDEs that I use (e.g., Eclipse, JavaBeans and Visual Studio) do not require payment of any type when I edit and test my code. The previous number may represent a negative number that when you extract the absolute value (Math.abs()) you may still get a negative number. 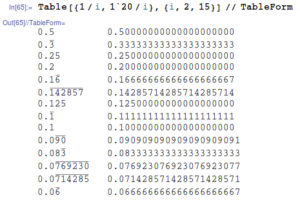 Like I mentioned, the challenge does not make references to ranges or negative values. The first string corresponds to an incorrect answer that a previous version of my code produced. The entire string is correct, but the repetitive cycle is produced later if one continues with the division operation further. The second string is the correct answer for the test. My current code passed it just by allowing more digits as you will see in the Java code. As usual, I include a Main() with some test code. A good thing to always do is to develop code using a test driven approach. As you can see by looking at the code, it reflects changes that were due to the failures on some of the unit tests. In general one always needs to consider the relationships between the data structure(s) and the algorithm. The HashMap, as suggested, blends with the algorithm quite nicely. I did experiment with Regular Expressions on the results, but decided to follow the hints. If you have comments or questions on this or any other blog entry, please send me an email.